In July, when we were on our family vacation in the Upper Peninsula, I drove up to one of my favorite spots on the planet – Whitefish Point. It’s breathtakingly beautiful – rolling waves, seemingly endless expanses of sky and water and miles of rock covered sand. I wandered along the beach for several hours shooting video, taking pictures and of course, picking up rocks and driftwood. 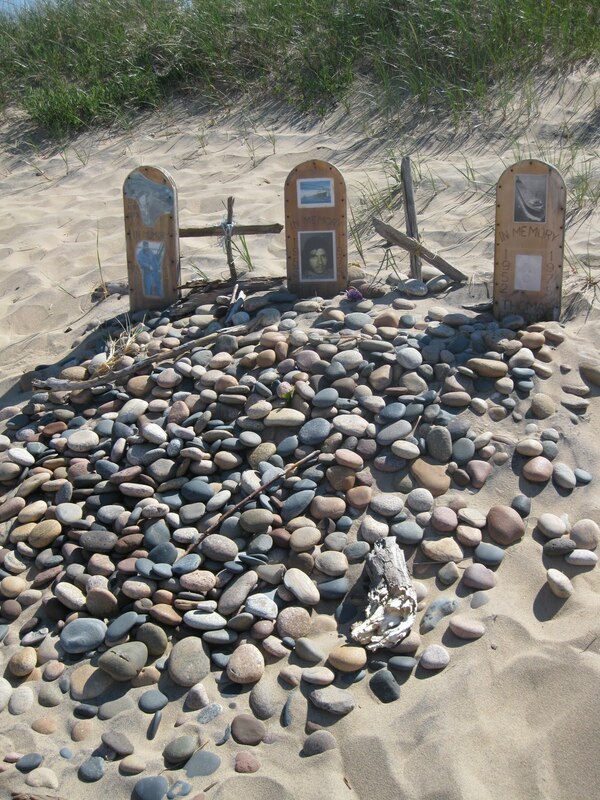 As I was lugging my bag of treasures back up the beach, I stumbled across what I thought was a pile of stones and driftwood made by bored kids, but as I looked closer, I realized it was a makeshift memorial by the families of three of the sailors on the Edmund Fitzgerald – Ransom Cundy, Bruce Hudson and Thomas Bentsen. I was a little kid when the ship sank, but I remember going to mass at my grandparents’ church with my mom and gram and saying prayers for the sailors. When we moved to a city near Detroit a few years later, the radio stations would broadcast the ringing of the bells at the Mariners’ Church (aka the Maritime Sailors’ Cathedral) every November 10th. It was such a sad, mournful sound. Somehow, it sounded worse over late 1970s FM radio. When I came upon the memorial I stopped for a minute, the memory of those sad, static-y bells perfectly clear in my head. I added three rocks to the pile. Even though it’s been 35 years, these three men still have families that love and miss them. They don’t have a grave to visit, but they have this gorgeous, peaceful spot. I’m guessing they must come to Whitefish Point fairly often since the memorial wasn’t there when I was up there two years ago. I think it’s a really beautiful testament to love and remembrance. What a wonderful, touching thing to stumble across! I'm impressed that you didn't just start scraping those stones into a bucket and hightail it your car. Wow… I still remember that song… I swear they always used to play it on the radio in certain parts of Ontario. I think I used it for history answers, lol. Very touching post and a reminder that those we love aren't that far away if we just remember. Glad Matt is back…now he can help you let the crazy out sssslllloooowwww. Oh, one of my favorite places EVER. Now I'm already planning a summer trip. And the memorial, what a lovely thing to find. Absolutely touching. What a wonderful story! I remember the song, too, but seeing something like this drives home the fact that that it was a true story. Thanks for reminding us. what a beautiful story. it touches my innermost. people live and die. but no matter what, our hearts is the best place they can remain.